SiamTeas Sample Boxes of our selected teas from China: 5 teas per box, ca. 20 grams per tea sample – the easy and affordable way trying our selection of Great Teas from China. 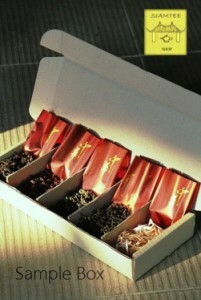 5 Great Teas of China in one SiamTeas Sample Box! 15 grams (depending on leaf material) of each of our selected finest Chinese Teas for you to try in a most convenient and affordably way! Please make your choices in the selection widget below. For more information please refer to the detailed product description below.